San Francisco, CA— It might have been raining outside, but inside was all Earth, Wind & Fire as musician and singer Tasche warmed up the crowd gathered at the fifth inauguration of San Francisco Public Defender Jeff Adachi on Tuesday morning. The ceremony took place in the Public Defender’s building and was officiated by Mayor London Breed. Breed made a point of describing her long relationship with Adachi, which began when she used to see him at her housing project when he came to visit clients. Mayor Breed was also in attendance four years ago as a supervisor when Adachi was sworn-in for his fourth term, causing Chief Attorney Matt Gonzalez to quip that newly elected District 10 Supervisor in attendance, Shamann Walton, might just end up with a higher office in his future. Gonzalez made a brief introduction to the event by thanking the elected officials in the crowd such as Walton, Judge Roger Chan, and District Attorney George GascÓn. Also in attendance was former San Francisco Public Defender Jeff Brown, who himself had served five terms prior to Adachi. 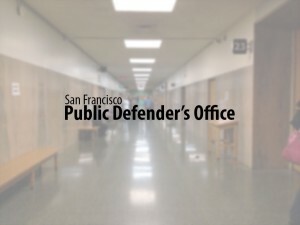 Gonzalez said that it was “critical” that San Francisco have an elected public defender, an institutional rarity that he said ensures valuable independence. Since Adachi has been Public Defender, the office has indeed grown significantly into an entity with over 100 attorneys, 80 support staff, and service to more than 20,000 clients each year. His sixteen-year tenure has brought critical resources to the department such as computers and sophisticated research tools, as well as paralegals, social workers, and a greatly expanded investigation unit. He also described how proud he was of the immigration defense unit and programs that lift up and support youth, such as, the MAGIC program and Juvenile Unit. As he neared closing, he brought it all back to Earth, Wind, & Fire, reciting the lines, “’Child is born/With a heart of gold/Way of the world/Makes his heart so cold’ –We need to change that,” he said. “A big part of that is ensuring that our kids have opportunities.” Going forward, Adachi stressed that his office will remain dedicated to providing the highest level of representation to its clients as it continues on its path towards true justice for all.